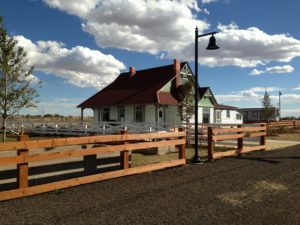 The National Register of Historic Places and Colorado State Register of Historic Properties are tools that recognize National Asian-Pacific American Heritage Month, celebrated in May. The Bromley Farm/Koizuma Hishinuma Farm in Brighton, Adams County, was listed in the National Register of Historic Places in 2007. Emmet Ayers Bromley came to Colorado in 1877 and became one of the largest sheep and livestock owners in Colorado. He established a long and distinguished record of public service, holding the positions of Arapahoe County deputy sheriff and deputy assessor. He served three terms in the Colorado House of Representatives and two in the Colorado Senate, where he sponsored the 1901 senate bill establishing Adams County. Following the Bromleys’ 31-year ownership of the property, the William O. Roberts family purchased and operated the farm until 1947, selling the land to the Koizuma family. The Koizumas and their relatives, the Hishinuma family, farmed the land until 2006. Japanese-American families made a major contribution to local agricultural and social history. Arriving in the first years of the twentieth century, Japanese immigrants and their descendants were recruited to work on irrigation ditch construction and to labor in the sugar beet fields. Many initially lived in migrant worker housing. As families saved money, some were able to purchase farms of their own. Typical of those in the Brighton area, the Koizumas and Hishinumas raised sugar beets, cabbage, alfalfa, and corn. The farm’s architecture represents the full range of buildings and structures necessary for the operation of a twentieth-century Colorado cattle ranch and farm, including a rare surviving example of transient labor housing. The farm’s owner, the City of Brighton, is re-imagining the site—restored in part with grants from the State Historical Fund and Adams County Open Space—as a multi-functional event and agricultural education center in part through operator leases with partners including Local Foods Campus. The Office of Archaeology and Historic Preservation’s Heritage Diversity Initiative seeks to celebrate the historic places significant to people of every language, culture, and background that comprise the Colorado story. Check out the growing list of historic places, including those related to Asian-Pacific American contributions to American history, at: www.historypin.org/en/person/75043. Submit your own story as well, either there or at: www.historycolorado.org/heritage-diversity-initiative. The National Register of Historic Places is the official list of the Nation's historic places worthy of preservation. Authorized by the National Historic Preservation Act of 1966, the National Park Service's National Register of Historic Places is part of a national program to coordinate and support public and private efforts to identify, evaluate, and protect America's historic and archaeological resources. The Colorado State Register of Historic Properties is a listing of the state’s significant cultural resources worthy of preservation for the future education and enjoyment of Colorado’s residents and visitors. Properties listed in the National Register of Historic Places are automatically placed in the Colorado State Register. They may also be nominated separately to the Colorado State Register without inclusion in the National Register.